The first target-towing unit made available to the fighter regiments of the 16.VA was activated at Köthen in May of 1946. It was then equipped with American Douglas A-20 Boston bombers modified for target towing-duties. These aircraft, delivered during the Great Patriotic War as part of the "Lend Lease" program, were codenamed "Box" by NATO. They moved to Stendal in 1951, only to move again to Schönefeld airfield that same year. The aircraft types on strength with the unit at that time were A-20, Tu-6 and La-5. In 1954, the squadron moved again, this time to Brand. Whereas the Tu-6 "Bat" aircraft still were flying, the first Il-28 "Beagle" entered the inventory the same year. 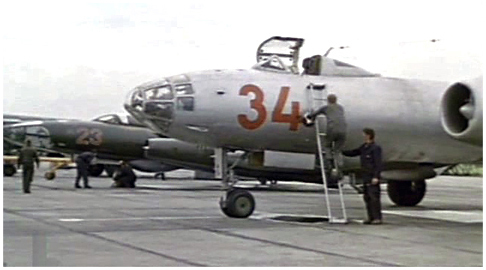 The 74th Separate Target-Towing Aviation Squadron (Otdel'naya Buksirovochnaya Aviatsionnaya Eskadril'ya) and its Il-28 was based at Parchim between sometime in 1954 and 1982. Could this have been the same unit whose wanderings we previously have described? Maintenance on these aircraft was performed at Brand, where the 277.BAP (Bomber Aviation Regiment) flying Il-28 "Beagle" bombers was based. The 74.OBAE vacated Parchim in 1982 to relocate to Damgarten. Meanwhile, a second squadron, the 65.OBAE, was stationed in Stendal from 1958 on. This unit also flew the Il-28 together with two Lisunov Li-2 "Cab." The latter also were assigned to target-towing tasks. 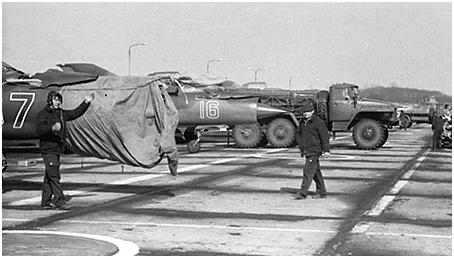 Yak-25RV "Mandrake" also were observed in Stendal at that time. However, we do not know if they were "RV" reconnaissance variants (the 931.OGRAP also was based at Stendal during the same period) or if they were "RV-I" variants that were used as targets for fighter pilots practicing interception of intruders such as the Lockheed U-2 flying at high altitude. The Yak-25RV-I could be distinguished by the tracer located under the rudder. 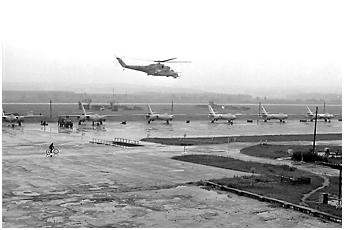 Some of these aircraft were assigned to the 773.IAP at Damgarten in 1962. 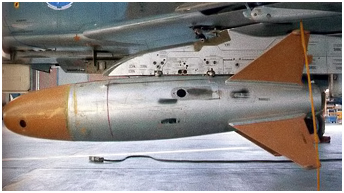 Incidentally, a target drone variant designated the Yak-25RV-II also existed. Le numéro 34 rouge du 65.OBAE sur la ligne de vol de Damgarten. En arrière-plan, un Yak-28R probablement de passage. © O.Kozlov. 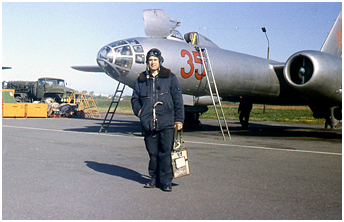 Bort 34 of the 65.OBAE on Damgarten flightline, next to a visiting Yak-28R. © O.Kozlov. The 65.OBAE left Stendal in 1971 for Oranienburg and finally moved to Damgarten in 1977. Consequently, from 1982 on, when the 74.OBAE also moved to Damgarten, all 16.VA target-towing assets were concentrated on a same airbase organized into two separate squadrons. Subordinate to the 16.VA, each squadron was composed of 12 Il-28s. The consolidation of the target-towing units at Damgarten was a rational decision as the Baltic Sea ground-to-air and air-to-air ranges, the latter also used by VVS units based in other Warpac countries that regularly deployed to Damgarten for firing training, were situated nearby. No less than five Soviet and East German firing ranges were spread along the Baltic Sea coasts. The westernmost polygon was a Soviet firing range located at Wustrow, east of Rostock. It was essentially used for anti-aircraft artillery and SAM systems personnel training. Further east, off Damgarten and Barth, the Zingst peninsula was home to a NVA range designated "Air firing area N°1" (Luftschießzone 1 - LSZ 1) that was divided into two sectors. The first was located in Zingst (Gefechtsstand 1 ) - to the east - and the second one in the "Mecklenburger Bucht" (Gefechtsstand 2 ) - to the west. Direct firing by the flak against targets towed by LSK/LV Il-28s (which were later replaced by L-39V) and An-2 took place in the western sector. 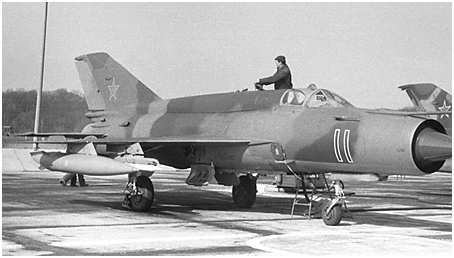 MiG-21 and MiG-23 also were used as "mirror" targets (1) in the eastern sector. The latter, which housed the living area, after 1974 also became the duty station of a training unit for SAM systems personnel, the FRAZ 40 (Fla-Raketenausbildungszentrum - Anti-Aircraft Missile Training Center). Atmospheric probe rockets also were launched from there beginning in the early seventies (the last one was fired on April 10, 1992). There was a third smaller firing range near Peenemünde airbase. One can still find today in the "Peenemünder Haken," near the coast, boat wrecks (including decommissioned landing craft from the East German Navy) that formerly were used as targets by the different NVA air components. Furthermore, these targets were used during Warpac exercises such as "Waffenbrüderschaft 80," when the ships were attacked by heavy bombers coming from the Soviet Union. Let's mention another small air-to-ground firing range that was located nearby. The latter was used by the aircraft of the JG-9 based at Peenemünde. The range was situated east, between the airfield and the coast. A fourth polygon located east of the Rügen island, was exclusively dedicated to air-to-air firing. It was available to Soviet fighter aircraft (2), LSK/LV aircraft (they designated the area LSZ 2) and also those of the Czechoslovak Air Force (which sent some aircraft once a year on round-trip flights with no landing in the GDR). The fifth range was reserved for the training of Soviet Navy gunners - less appreciated by the target-towing aircraft crews because of their propensity to open fire too soon - and those of the East German Navy. It was located between the Polish town of Swinoujscie (Swinemünde) to the north, right on the border with East Germany and Ueckermünde to the south. 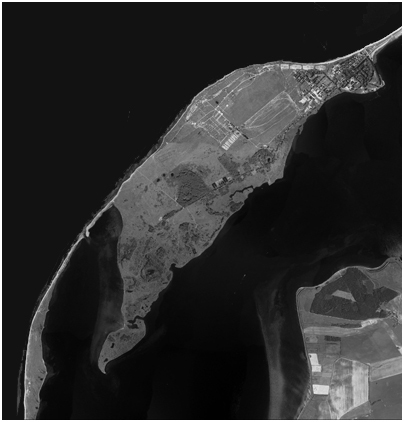 The Wustrow Peninsula already had become a AAA training site back in 1934. A grass airfield 1000 meters long and 1000 meters wide that included a slipway for floatplanes was also developed. The target-towing aircraft were Junkers W34 equipped with floats and Ju-52s. The site again was used for the same purpose by the Soviets after the war. A coastal artillery unit was based at Wustrow until the late 1950s. Moreover, the NVA also practiced AAA firing from the peninsula before moving these activities to Zingst towards the end of the decade. Some Li-2s were observed in 1959 and they probably were employed to tow targets. Anyway, the aerodrome became inactive in the following years. On the other hand, a helicopter landing point (N°253) was created. Curiously, nearly 20 aircraft and helicopter decoys were deployed on the former airfield. Photographic evidence of this dating back to the 1980s exists (at left). It is likely that they were mock-ups of NATO aircraft used to instruct conscripts. This kind of mock-ups representing aerial or terrestrial equipments, could indeed be found on several training ranges. The true purpose of these decoys remains to be discovered: were they supposed to make believe that the airfield was still active? In addition to conventional anti-aircraft guns, tracked anti-aircraft armored vehicles (ZSU-27, ZSU-23-4) also were training at Wustrow. 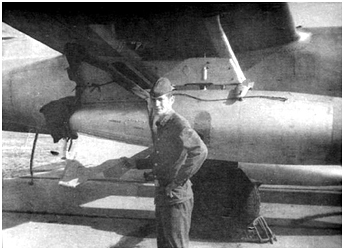 The guns were aimed both at air (towed targets, PM-6), ground or sea targets. In the latter case, the targets were towed by boats that sometimes sailed up to eight kilometers offshore. All maritime traffic was prohibited in the area within 15 km. A training track for armored vehicles and an exercise area for the infantry also were located there. In addition, Wustrow subsequently also became a training center for SAM system personnel. It would seem that Wustrow beaches were used in amphibious training exercises. Upon withdrawal from Germany, landing craft also were used to evacuate material. The living area was established at Rerik, east of the peninsula. Various elements of the Baltic Fleet were also stationed in Rerik-Wustrow from 1946 on until the end. The core was composed of units controlling maritime traffic - especially after the war, when minefields were still present. A separate enclosure with its own fences and a guardhouse, was lit at night. It housed the Navy facilities: barracks, radars, radios and beacons. It was also probably a support facility for Electronic Intelligence activities. The dark side of Wustrow did not end there. The Second Special Reconnaissance Brigade of Soviet military intelligence or GRU, also took up residence at Wustrow. Essentially from Rote Plätze by S.Büttner and L.Freundt (AeroLit) & Die verbotene Halbinsel Wustrow by Edelgard and K.Feiler (Ch.Links). Des MiG-21bis du 515.IAP de Tököl (Hongrie) lors d'une campagne de tir à Damgarten en 1984. © A.Timokhin. MiG-21bis of the 515.IAP from Tököl (Hungary) seen in 1984 at Damgarten during a firing camp. © A.Timokhin. Ce MiG-21bis du 515.IAP était equipé au-dessus du viseur tête haute d'un petit boîtier destiné à la mise en oeuvre d'une bombe nucléaire tactique, ainsi que d'un pylône ventral BD3-66-21N destiné à recevoir cette dernière. © A.Timokhin. 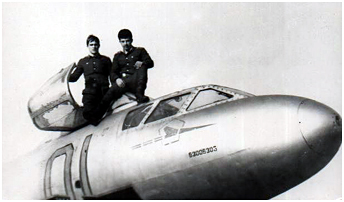 This MiG-21bis of the 515.IAP was equipped with a switchbox above the HUD that was used to drop a tactical nuclear bomb. A dedicated BD3-66-21N pylon for a nuclear bomb was attached under the fuselage. © A.Timokhin. Extrait d'un film tourné à Damgarten, nous permettant d'observer la perche (courte) de remorquage d'un Il-28. Les canons NR-23 de la tourelle de queue étaient déposés. © O.Kozlov. Close up on the short towing boom of a Damgarten based Il-28. The NR-23 tail turret guns were removed. © O.Kozlov. Il-28 Buksirovshchik Misheney (Il-28 Target Tug - they were never designated Il-28BM) that flew for the benefit of the ground and air forces, were modified bomber or reconnaissance versions. The latter Il-28R had wingtip-mounted tanks. 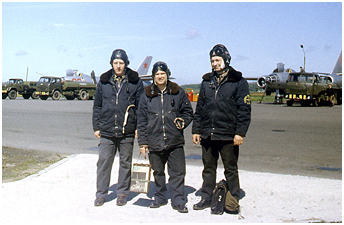 Target-towing "Beagle" crew composition was similar to that of other Il-28s: a navigator (Shturman) in the glazed nose, a pilot (Pilot) and the aerial gunner-radio operator (Vozdushnyy Strelok-Radist) who monitored the towing system. These particular Il-28s carried inside their bomb bay a BLT-5 or a BLM-1000M winch. They could winch a cable of 1800 meters long with a diameter of 5 mm or a 3 mm cable 4000 meters in length. Damgarten aircraft usually deployed a cable 1000 or 1800 meters in length. A cable cutter was mounted inside the bomb bay and was used if the damaged target could not be winched back safely. 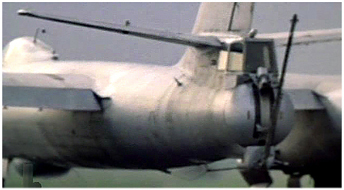 During the 1980s, the Damgarten-based Il-28s had a long boom articulated below the unarmed tail turret. During takeoff and landing, that rigid link was used to tow either a 7BM-2M target looking like a big dart or a PM-3Zh target with long straight wings positioned at the rear of a pointed fuselage with a large squared vertical tail. The target then was disconnected from the boom in flight and towed by the cable. It has been reported that modified Il-28R models had a longer boom, but that was probably related to the type of target being towed. Those targets were used for ground-to-air gunnery. Quelques cibles PM-6 de la NVA furent testées par la Luftwaffe. Celle-ci était accrochée sous l'aile d'un F-4F du centre d'essais de Manching. © WTD 61. Some former NVA PM-6 targets were tested by the Luftwaffe. This one is seen under the wing of a F-4F of the Manching test center. © WTD 61. "Beagle" could also carry PM-6R and PM-6G diving targets mounted underwing. Those reusable targets weighing 141 kg were 3M74 long for a wingspan of 1M14. Although looking like bombs with enlarged fins, they were used to simulate diving bombers and glide bombs and were equipped with smoke tracers to improve their visibility. 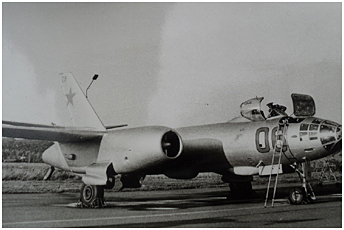 The target's reflective surface equated to that of a MiG-17 aircraft. The PM-6 usually was launched from an altitude of 6000-8000 meters and dove at an angle of 35-70°. The flight speed of the target in the engagement sector was 200-220 meters per second (720-790 km/h), and flight time prior to recovery parachute opening at an altitude of 750-1000 meters was 40-45 seconds. A part of the video from which some pictures illustrating this page were extracted, can be watched > HERE. (1) The target aircraft was detected by the firing unit radar. A second radar repeated this radar echo of the target with different coordinates. It is towards this second fictive or mirror echo that shells or missiles were fired. A special device permitted to assess whether the target had been hit. Schematic diagram > HERE. 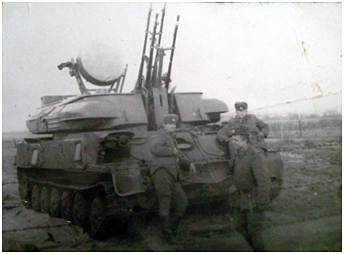 (2) Soviet units based in Warsaw Pact countries were sometimes deployed to Damgarten for firing training. Known exemples are the 114.IAP from Milovice (CSFR) on MiG-23M and the 515.IAP from Tököl (Hungary) operating the MiG-21bis in 1984. The range was controlled from Barth (callsign Model). When the range was used by the Czechoslovakians, a controller of the same nationality was on duty. An Antonov 26 of the 226.OSAP operating from Damgarten for the occasion, was responsible for range security. 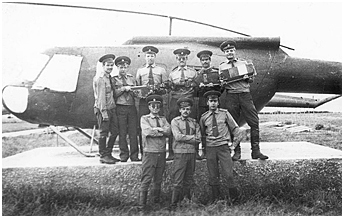 The 82 Aviatsionniy Poligon (Aviation Range) was the unit responsible for the range management.